Home >> Blog >> Learn about Pumpkins! Interactive Notebook Activity! Learn about Pumpkins! Interactive Notebook Activity! 1. Pumpkins are thought to have originated in Central America, specifically Mexico. Some seeds found date back to 5500 B.C. 2. Top pumpkin growers are U.S. farmers, growing more than 1.5 billion each year. pompon. The English used “pumpion” and colonists used “pumpkin”. pounds of sugar, 14.5 pounds of cinnamon, 7 pounds of salt and 2796 eggs were used. It weighed 3699 pounds. 5. Did you know that pumpkins are 90 percent water? 6. Some people used to believe that pumpkins could cure snake bites and help remove freckles! 7. 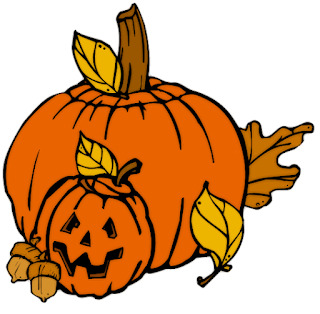 In addition to orange, pumpkins can be green, yellow, tan, white,red and blue. 8. The “Pumpkin Capital of the World” and home to Libby’s Pumpkins is Morton, Illinois. 9. The fibrous strands of string and seeds are called the “brains” of the pumpkin. 13. In 2013, Keene, NH, kept the record for the most lit pumpkins! 30,581. It holds the record in 2016, too. 14. 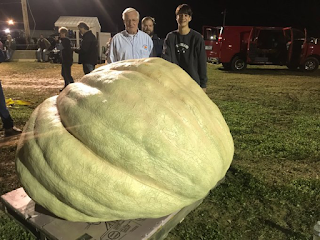 Crowned the record heaviest pumpkin grown in North America(2018), a man from the state of New Hampshire grew a pumpkin which weighed in at a whopping 2528 pounds. It beats the previous North American record which was grown in 2017 weighing in at 2363 pounds. Pumpkin growers say that a 3000 pound pumpkin is possible in the near future! It wasn't that many years ago that a 1000 pound pumpkin, now a light weight, would have been news worthy. The problem with growing such jumbos is that gravity often causes them to get smooshed and then they can't qualify for judging. A. Do YOU carve a pumpkin during this time of year? If, so, what type of face do you create? B. Do you prefer carving or painting a pumpkin? C. What is your favorite type of pie? 1. Illustrate a picture of one of the facts learned. 2. Write a poem about a pumpkin.Pretend you are a pumpkin and write about your day in the pumpkin patch, on a porch or waiting to be purchased at a farmer’s stand. 3.Discuss syllables. 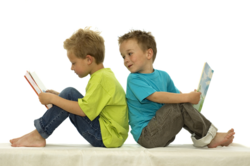 Find 7 words that have 4 or more syllables. 4. Can you spot 7 ACTION VERBS in the Pumpkin Facts? 5. Write an acrostic poem using each letter in the word, PUMPKINS. 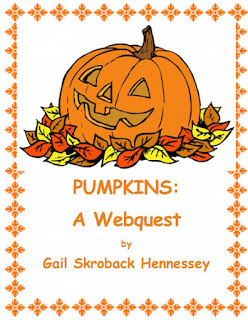 Try my webquest on Pumpkins: 10 web questions with several comprehension questions(lots of extension activities). Also, download this FREE Activity Guide: Learn about Pumpkins!